This fall we have different parties and events every weekend. Amongst are insanely busy schedule we've been testing a few recipes here and there for great party snacks/hostess gifts to bring along. 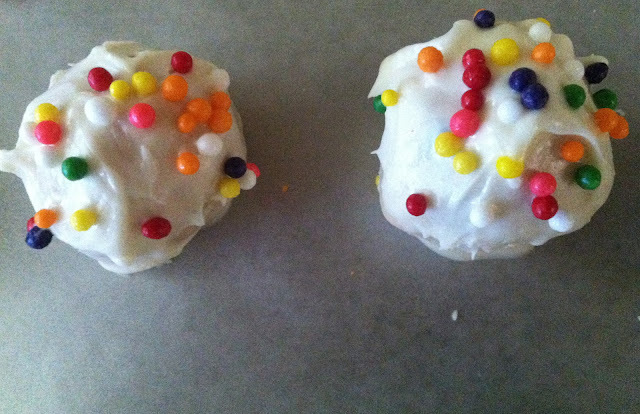 The cake truffles were perfect and quick no-bake recipe that can be decorated to fit the theme of any type of event. Above is a classic birthday version. Enjoy! instructions: Mix the butter (softened) and sugar with an electric mixed until blended. Add cake mix, flour, vanilla extract and mix until combined. Add a couple of tablespoons of milk to the mixture. Depending on the cake mix, more milk might be needed to create better dough consistency. Roll the dough into one inch balls and place a wax paper lined baking sheet. Chill the truffles in a fridge for about 15 minutes. the topping: melt the almond bark in the microwave at 30 second intervals. Take out and stir to make sure it doesn't overcook. Once completely melted, dip the chilled truffles into the topping with a fork and place them back on the wax paper. Top with sprinkles and allow them to cool for a few minutes and they are ready to serve!